Electron micrograph of skeletal muscle and corresponding molecular structure of a sarcomere, a. This high-magnification electron micrograph shows a longitudinal section of the myofibrils. The I band, which is bisected by the Z line, is composed of barely visible, thin (actin) filaments. They are attached to the Z line and extend across the I band into the A band. 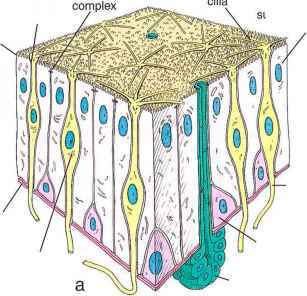 The thick filaments, composed of myosin, account for the full width of the A band. Note that in the A band there are additional bands and lines. One of these, the M line, is seen at the middle of the A band; another, the less electron dense H band, consists only of thick filaments. The lateral parts of the A band are more electron dense and represent areas where the thin filaments interdig-itate with the thick filaments. x35,000. b. Diagram illustrating the distribution of myofilaments and accessory proteins within a sarcomere. The accessory proteins are titin, a large elastic molecule that anchors the thick (myosin) filaments to the Z line; a-actinin, which bundles thin (actin) filaments into parallel arrays and anchors them at the Z line; nebulln, an elongated inelastic protein attached to the Z lines that wraps around the thin filaments and assists a-actinin in anchoring the thin filament to Z lines; tropomodulin, an actin-capplng protein that maintains and regulates the length of the thin filaments; tropomyosin, which stabilizes thin filaments and, in association with troponin, regulates binding of calcium ions; and myomesin and C proteins, myosin-binding proteins that hold thick filaments in register at the M line. The interactions of these various proteins maintain the precise alignment of the thin and thick filaments in the sarcomere. C protein like portions of the protein adjacent to the thin filaments help stabilize the centering of the myosin-containing thick filament, preventing excessive stretching of the sarcomere. • a-Actinin, a short, bipolar, rod-shaped, 190-kDa actin-binding protein, bundles thin filaments into parallel arrays and anchors them at the Z line. • Nebulin, an elongated, inelastic, 600-kDa protein, is attached to the Z lines and runs parallel to the thin filaments. It helps a-actinin anchor thin filaments to Z lines and is thought to regulate the length of thin filaments during muscle development. • Tropomodulin, a small, ~40-kDa actin-binding protein, is attached to the free portion of the thin filament. This actin-capping protein maintains and regulates the length of the sarcomeric actin filament. Variations in thin filament length (such as those in white and red muscle fibers) affect the length-tension relationship during muscle contraction and therefore influence the physiologic properties of the muscle. • Desmin, a type of 53-kDa intermediate filament, forms a lattice that surrounds the sarcomere at the level of the Z lines, attaching them to one another and to the plasma membrane, thus forming stabilizing cross-links between neighboring myofibrils. • Myomesin, a 185-kDa myosin-binding protein, holds thick filaments in register at the M line. • C protein, one of possibly several myosin-binding proteins (140 to 150 kDa), serves the same function as myomesin and forms several distinct transverse stripes on either side of the M line. The light microscope reveals that during contraction the sarcomere and I band shorten, while the A band remains the same length. To maintain the myofilaments at a constant length, the shortening of the sarcomere must be due to an increase in the overlap of the thick and thin filaments. This overlap can readily be seen by comparing electron micrographs of resting and contracted muscle. The H band narrows, and the thin filaments penetrate the H band during contraction. These observations indicate that the thin filaments slide past the thick filaments during contraction. Dystrophin is a rod-shaped cytoskeletai protein with a short head and a long tail that is located just beneath the skeletal muscle cell membrane. F-actin is bound at the end portion of the tail. Two groups of transmembrane proteins-a- and (J-clystroglycans and a-, 0-, 7-, and 8-sarcoglycans-participate in a dystrophin-glycoprotein complex that links dystrophin to the extracellular matrix proteins laminin and agrin. Dystrogly-cans form the actual link between dystrophin and laminin; sarcoglycans are merely associated with the dystroglycans in the membrane. Recent research has successfully characterized the dystrophin gene and its products. Several forms of muscular dystrophy are attributed to mutations of single genes encoding several proteins of the dystrophin-glycoprotein complex. Duchenne's and Becker-type muscular dystrophy are associated with mutations that affect dystrophin expression; different forms of limb girdle muscular dystrophy are caused by mutations in the genes encoding the four different sarcoglycans; and another form of congenital muscular dystrophy Is caused by a mutation in the gene encoding the a2 chain of muscle laminin.